Please Note: Additional methods to enroll participants include using the Administration block and Self Enrollment. 1. Log into Community Moodle and open your desired course. 2.Click the edit button at the top right of the screen. From the Add a Block dropdown menu, select Enroll users CSV. 3. 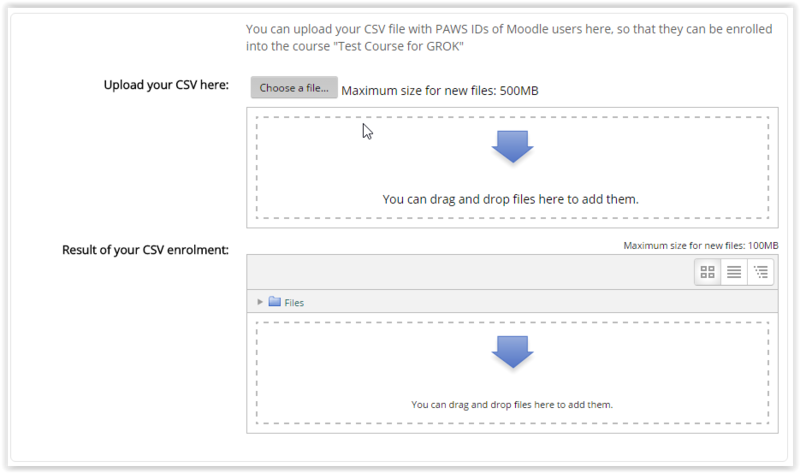 The Enroll Users CSV block should appear in your course. Click Manage Uploaded Files. 4. You will need to create an CSV file with a list of PAWS IDs you would like to Enroll. NOTE: You do not need a header or any other information. Only your students' PAWS IDs. ***IMPORTANT NOTE: Users who have never logged into Community Moodle will not be able to be enrolled into a course. They must first log in. 5. 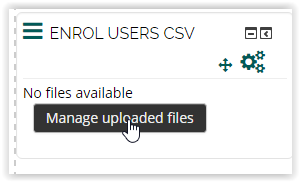 Upload this CSV file using the Choose a File button or drag and drop it into the open window. 6. Select Save Changes at the bottom of your screen.